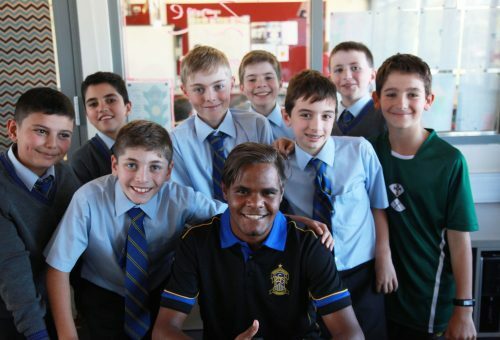 From 18 to 24 May, a group of students from St Joseph’s Flexi Learning Centre in Alice Springs came to stay with us as part of our ongoing and reciprocal relationship. We shared meals and sport, and connections were instantly made. On Saturday 19 May, SPC hosted the Reconciliation Round of sport and the fellas presented our First XI and First XV teams with their special Reconciliation Jerseys before heading to the Swans match in the city. On Sunday they had a surfing lesson and burger lunch at Maroubra then went go-karting. From Monday to Wednesday the group spent time in various classes including French, Drama, English, Sport, TAS, Maths, Science and the Junior School. They had the opportunity to experience some of Sydney with a drive around the harbour and spent time in the local area. All in all the experience was a happy and positive one for everyone involved. We look forward to our return visit to Alice Springs in a couple of weeks when we will be able to experience the hospitality extended by our new friends.